Modern geodynamics deals much with the play of water and dry land during the geological history of planet Earth. It is a highly complex field of research but crucial in our attempt to try to understand the landscapes of our world. There have been periods when waters have covered mountains and valleys deep under like by a garment - the Psalmist may actually refer here to the ancient story of the Flood - and massive tectonic movements that have raised mountain ranges or folded them over. A vivid image of the process is given by the relatively young formation of Himalayas as the Indian continental plate pushes against the Asian plate and causes the majestic mountains to rise. Similar pushes have happened throughout the geological history of planet Earth. 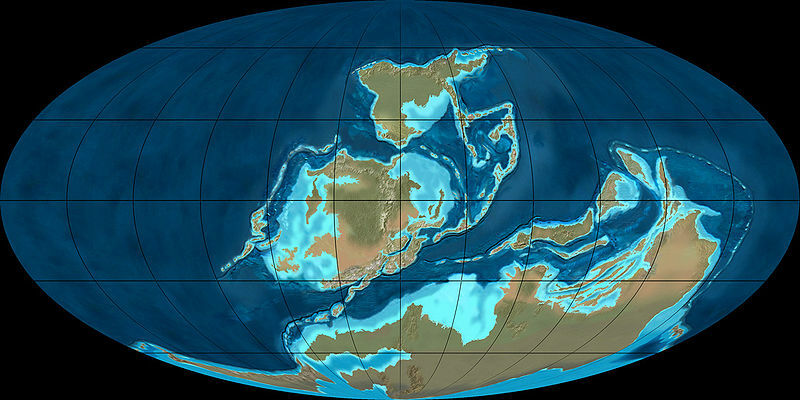 The reconstruction shows part of the map of Earth before the majestic Caledonian orogeny took place. 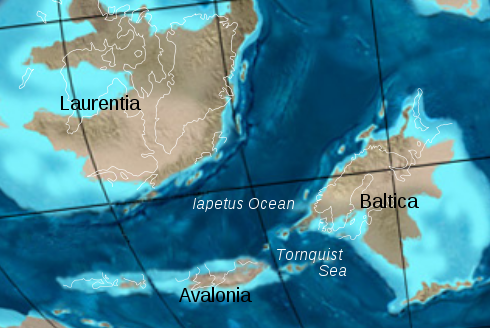 The land masses of Laurentia are separated from Baltica by the huge Iapetus Ocean. Baltica is separated from Avalonia by the Tornquist Sea. Tectonic plates laying under the crust of Earth moved slowly during the Devonian Epoch driving away the waters of the separating seas and pushing the edges of the plates up into mountain ranges. Later on, continental drift again separated the land masses eventually creating what became the Atlantic Ocean between America, Eurasia and Africa. The enormous pressure of land masses pushing against each other lifted massive mountain ranges that may have been as high as the Himalayas today. Later events and erosion has "polished" the Caledonian mountains into soft shapes and much lower remains perhaps one fifth of the original at 2000 meters or so. Nature thrives towards the peaceful balance of flat landscapes without the physical tensions that are caused by mountains and valleys. The Caledonian orogeny is a mountain building era (orogeny) recorded in the northern parts of the British Isles, the Scandinavian Mountains, Svalbard, eastern Greenland and parts of north-central Europe. The Caledonian orogeny encompasses events that occurred from the Ordovician to Early Devonian, roughly 490-390 million years ago (Ma). It was caused by the closure of the Iapetus Ocean when the continents and terranes of Laurentia, Baltica and Avalonia collided. 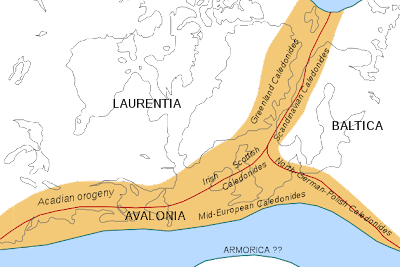 The Caledonian orogeny has been named for Caledonia, the Latin name for Scotland. The name was first used in 1885 by Austrian geologist Eduard Suess for an episode of mountain building in northern Europe that predated the Devonian period. 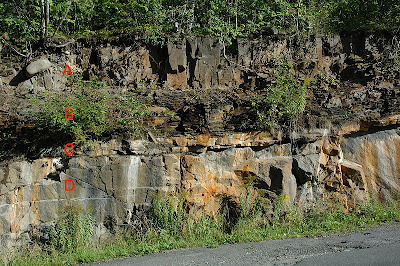 Geologists like Émile Haug and Hans Stille saw the Caledonian orogeny as one of several episodic phases of mountain building that had occurred during the Earth's history. Current understanding has it that the Caledonian orogeny encompasses a number of tectonic phases that can laterally be diachronous. The name "Caledonian" can therefore not be used for an absolute period of geological time, it applies only to a series of tectonically related events. The fascinating geological map by Bjoertvedt gives detailed picture of the Keel as part of the extremely complex geological map of Scandinavia, Finland and the Baltic area. 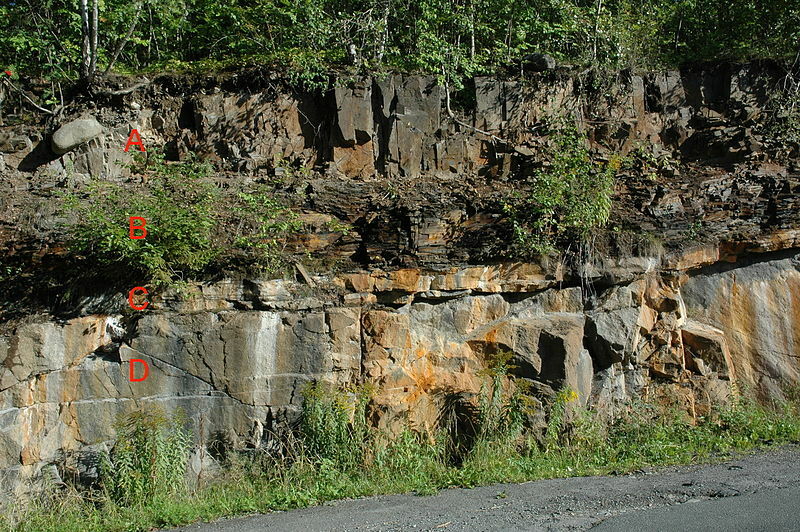 Many parts of planet Earth are covered with later sedimentary rocks covering like thick garments older rock formations sometimes under kilometres thick deposits. The Caledonian orogeny is Postcambrian but in this Nordic corner of the world we can study it in relation to the early geological history of Precambrian Earth. Learning about the making of the Keel and the landscapes surrounding it are in my mind a fascinating and also theologically significant exercise. It is admittedly very demanding and I confess my utter ignorance of most of the subjects mentioned here - I have much to learn and I am very eager to learn more as a Christian, child of the God who made these majestic landscapes of Scandinavia. Not so Young Earth Creationists. Because of the shackles of their faulty hermeneutics and forcing human rationalism into the Biblical revelation in all its intended ambiguity and complexity, YEC people must close their eyes to all this. It is impossible that there was a Devonian period when Laurentia and Baltica moved towards each other creating nappes and what not? For all the Earth was made in seven days of creation about 4000 BC and so it must be. From this divine knowledge - that contradicts what we can learn from God's nature - they must find an explanation to the rise and fall of the Keel in what is geologically speaking less than a second. They do so with admirable zeal, piety and imagination, thereby forging both the great work of Creator and falsifying the Word of God and bringing shame to the name of the God of Israel.